T.S. Arthur has formed near the coast of Belize. It will soon be downgraded into a tropical depression as it moves inland. It is possible that Arthur will reach tropical storm strength again if it moves over the Bay of Campeche. This is part of the circulation of Alma that was embedded in the monsoon trough. Some models eventually show a northward motion in several days, so the extended forecast is uncertain. T.S. Arthur is now over northern Belize. It has moved slowly west, now maybe just south of west. Significant heavy showers remain over the western Caribbean and into the Yucatan. Forecast models drift Arthur near or just south of the Bay of Campeche. Arthur will become a depression as it sits over land, then may strengthen to a minimal tropical storm if it gets back over water. 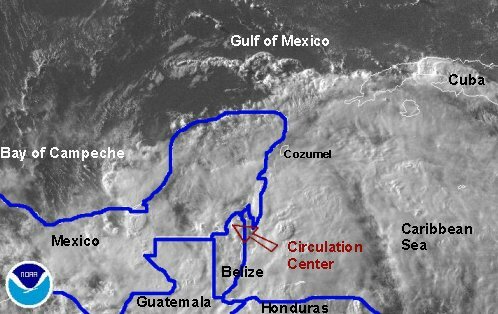 Right now it appears that the center may move just south of the Bay of Campeche. If that is indeed the case, it will remain a depression. In either case, the effects will be the same, heavy rain over the Yucatan and neighboring region. Some models try to take a surge of moisture northward later in the week, but Arthur should have disipated by then. Well, it looks like NHC read our previous post! They have shifted their track south so that it stays just south of the Bay of Campeche over the next couple of days. 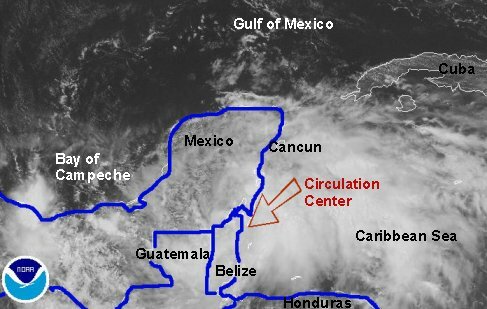 The latest satellite imagery shows that the center of circulation has almost not moved since the last update. Arthur is still meandering in extreme northwest Belize at minimal tropical storm strength (40 mph). NHC's assessment looks good with squalls , no doubt that strong east of Belize. Notice the two circled areas. These are the zones of the heaviest rain. One is over the Mexican states of Tabasco and Chiapas and the other north of Roatan to east of the Belize coast. There is not much change in the models. Arthur should become a depression and wander around southern Mexico for a few days. Flash flooding is the biggest threat. Some sort of tropical moisture surge is still forecast to move into the Gulf later in the week. There has been very little change from our previous report. The track and intensity are essentially the same, as well as the heavy areas of rain. Very heavy rain continues from near the Bay Islands of Honduras northward especially east of Belize. The center of circulation is difficult to locate. The next update will be in a few hours after several visible satellite images come in. Tropical depression Arthur continues on its course west-southwest. It will likely be downgraded later tonight even though heavy showers still remain. The heaviest rain stretches from Belize to Guatemala into southern Mexico. Flash flooding will continue to be a concern, especially in higher terrain. The heaviest rain on TropicalWeather.net's Tropicast is indicated where the clouds are white. Arthur is now a remnant low west of Guatemala in southern Mexico. Numerous showers and storms continue from the Belize coast into Guatemala and southern Mexico. Heavy rain with flash flooding is still possible. 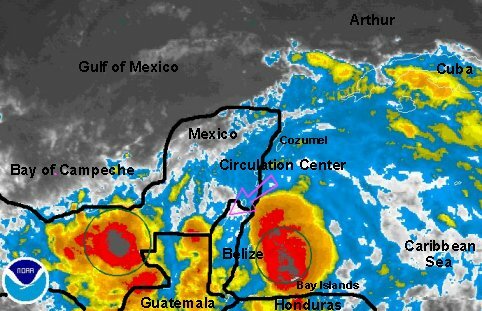 The same area of disturbed weather n the monsoon trough that caused Alma and Arthur will likely cause another storm to develop today or tonight off of the west coast of Guatemala. This is the last update on Arthur.